If you were hoping for a break in Android upgrade posts now that Froyos been announced, I’ve got bad news. 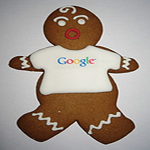 During yesterdays web-centric keynote, Google announced the WebM project, and the folks over at Eurodroid noticed a tasty little bit of information on the FAQ page: a tentative release date for Gingerbread. The FAQ in question states that WebM support in Android is expected in the Gingerbread release which is currently planned for Q4, 2010! Even though Froyo was just officially announced this morning, we now have a general idea as to when Gingerbread will start hitting devices. If you tuned into the keynote, you likely saw the teased features from an unspecified and upcoming version of Android. Our guess is that most of these features will make it into Gingerbread, although they could just as well be pushed as smaller updates even before that.